It's useful to know guitar tuning harmonics if you want accurate tuning for playing alone (this doesn't work for playing with other, perfectly tuned instruments) and you don't have an electronic tuner at hand. This particular method isn't used as much as the 5th fret method because it takes a little longer to master. But hopefully by the end of this lesson you'll be ready to use it for life. Just like the 5th fret method, harmonic tuning tunes the guitar to itself almost perfectly (and tuning can never be perfect on a fretted instrument made of wood!). This is known as relative tuning. Position your finger as though you're about to fret the string, but instead of positioning it over the fret space you need to position it over the fret wire. Now, instead of pressing down to fret the string, hold your finger over the string barely touching it. the top part of your finger should just brush over the top of the string. Remember to keep your finger in line with the fret wire! The yellow spot in the diagram below is the spot you want here. Now strike the string as usual with your pick hand, and as soon as you hit the string, pull your fret finger away. ...then your finger is not quite touching the string enough. ...then you're not pulling your finger away quick enough after you've picked the string. Also, check it's positioned on the fret wire not the space between the fret wires. Tip: try and hit the string with the very end of your plectrum to get the sharpest strike possible - this will enhance the harmonic's presence. I know it's easy to say, but "practice makes perfect". Seriously, the more you train your finger to position accurately as outlined above, the quicker you'll be able to throw up a harmonic when you need it. Starting with the low E string, this will be our base, as this method of tuning is about "tuning the guitar to itself", also known as relative tuning. It's useful, however, to know roughly what a low E should sound like (over time, you'll be able to get a closer approximation of perfect pitches). So, at the 5th fret wire we're going to use the harmonic technique outlined above for the low E string. Once the harmonic is ringing out from the E string, play the A string harmonic at the 7th fret. Now, when you've struck the harmonic for both these strings and it's ringing out for both at the same time, you will hear a kind of "wobble" effect, as if the note is oscillating. If it's already tuned perfectly, however, you won't hear this effect. What you need to do is listen for this vibrating sound between the two harmonics and tune up or down until the vibration becomes slower and slower... until it stops. Listen really closely to this next clip and hear the wobble! Did you hear it? Turn your volume up and you'll hear me tuning the A string up until the harmonic vibration is straightened out. This occurs when the imperfect interval between the two notes becomes perfect (or at least perfect to our ears). If the A string is tuned too high, it will have a similar oscillating effect, but you'll need to tune down and then back up (this is because tuning up helps to lock the string's tension, keeping it in tune longer). So, once you get the harmonics of 5th fret E string and 7th fret A string nice and constant, the two strings should be tuned to each other perfectly, or at least almost perfectly! 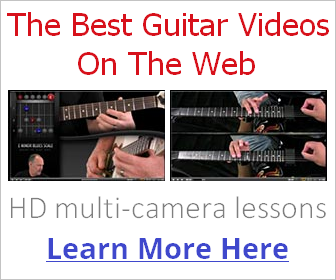 You should now have a well tuned guitar! Strum a few chords and tweak as necessary. Using tuning harmonics can be a very quick and accurate way to tune up your guitar, but it's not known by many guitarists. Learning to play harmonics also comes in handy with lead guitar, as an interesting effect you can use, especially under high gain/distortion, so it's a good technique to master anyway.